Peeled, sliced, eaten raw as well as added to spicy garden salad. Like a sweeter radish with a slight broccoli taste. Will plant more of these. Click here for nutritional info.. 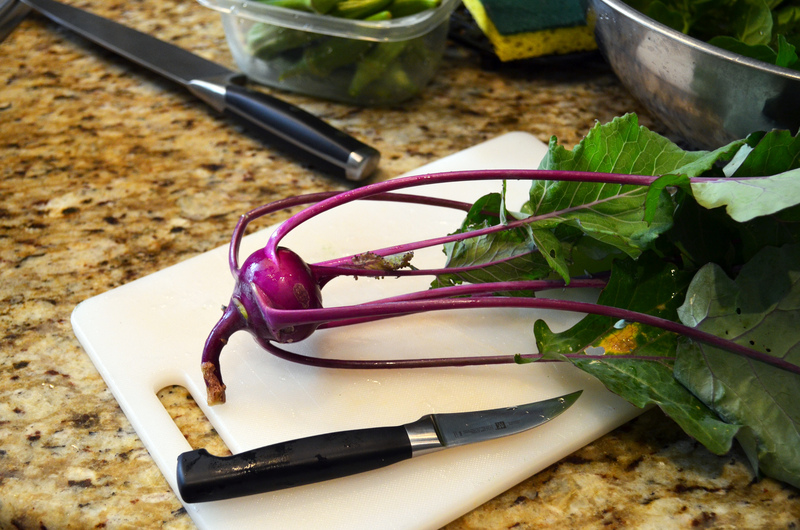 I love kohlrabi. It’s supposed to be good cooked in a variety of ways but nothing beats raw. I peel it and then eat it like an apple. One of these a day (or 2 or 3) surely helps keep the doctor away. But I’m jealous – I’ve failed miserably at getting such a perfect bulb like you have in the photo. I’m pretty sure I didn’t supply a good, constant watering (they like water). I’ve got new seedlings in the ground – I’d like to keep these things coming good all year round. Sliced and boiled like a potato , drained salt pepper and butter….yum! Drip irrigation on a timer seemed to work well for these (although the rutabaga drowned a bit next to them). They were small but then again this is a smaller variety.